As someone who likes to attempt DIY projects on my own, Hometalk has become an important resource for all things related to a “home.” I have even started checking the Hometalk site before I Google. (Don’t tell Google though.) My two main go-to sites for inspiration and how-to tutorials are Hometalk and Pinterest. 9 times out of 10 I don’t have to look any further than these two places. After I published my Rain Boot Vase post I was strolling around Hometalk and saw tons of great porch pot and planter inspiration. So…to keep all the inspiration posts organized, I set up a clipboard. It’s sort of like Pinterest but not really. Make sense? Clipboards are a feature Hometalk offers to “clip” your favorite posts to themed boards. It’s all done right there on the Hometalk site. Once you see a post you’d like to clip, all it takes is two clicks and you are ready to move on. Easy peasy. If you haven’t looked around Hometalk and have a minute, check it out. It’s a really great way for a non-blogger to post pics of a project and share it with others. Totally free and user-friendly! Like the rest of America, my heart is heavy with sadness for the city of Boston. In today’s world, it’s hard to be sure of anything. One thing I do know is that when something bad happens, it can bring out the best in man kind. Bless the heroes of Boston. 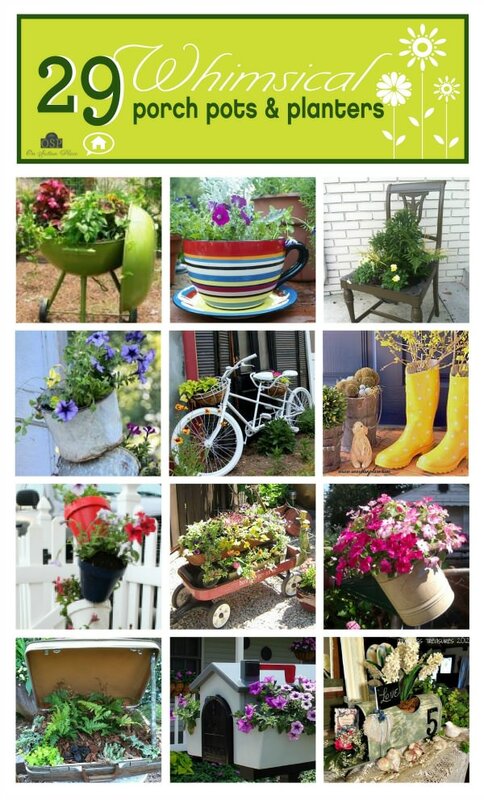 Lots of great Spring inspiration Ann!…I love those “boots” of yours!!! Ann, you are such an inspiration to people on Hometalk. From boot planters to caulking bathtubs…is there anything you can’t do?? Thank you so much for sharing! I see so many unique and creative ideas you shared. Love that painted grill being used as a planter! Your boots idea was charming too. Sounds like I need to visit that site! I feel so hurt for the people of Boston. I truly do! I can’t seem to focus on anything else. It has been helpful reading about and hearing stories about the brave men and women who helped the victims of the terrorist attack. The cute little planters helped brighten my day, Ann. Thank-you for posting the mosaic. Ann, thanks for including our old grill in your roundup! It’s still out in the flower bed and the chives that are in it are blooming. I just finished curating a board on Hometalk about growing tomatoes! Great roundup! I have been very ready to get some flowers out. Hansel and Gretel needs some garden love! I have seen Hometalk, but I do not have time to spend on it and Pinterest, too, unfortunately. I love the planter ideas that you’ve posted, especially the little wagon and I actually have one! I just haven’t used it yet, I don’t know where to, so it sits in my garage year after year…oh well. Have a good day, Ann! These are such fantastice ideas, I am loving them. Very inspirational!! Thanks for the heads up on Hometalk – I’m heading over there now Ann. I actually browsed in the flowers today at the hardware store….Maybe next week! LOL I can’t wait too long…boy they sure go fast! Oh look at all those ideas!!! I’m elbow deep in herbs and dirt. I should have checked here BEFORE I started planting (face palm). Great ideas! Those are some wonderful ideas! I need to get some annuals and get busy!!! GREAT ideas! I’m dying to get going on the outside but with last week’s ice storm…soon though. Soon. Thanks for the tip – I’ll have to go over for a look. I love anything just a little different for the garden. Perfect for Spring, all of them! Great roundup Ann! Love your rainboot vase idea!! So charming and cheery! Ann, these are such cute ideas! I finally got all of the pots done out back; now I need to do the front porch. These are some great inspiration photos! Ann, I enjoy seeing all the creative ideas from very talented ladies. Your rain boot idea is very cute and makes me think of possibly doing one. Our weather has finally warmed enough to plant flowers in pots for the porch. I think it is still too early to put them outside without cover. Have a fun productive week!